Our East Coast Explorer Package is designed to allow you to combine the east coasts two most popular destinations in a way that fits your individual travel. Fraser Island and the Whitsunday Island adventures are a must see and you can not come to Australia without driving the sand dunes on the world's largest sand island and snorkel the Great Barrier Reef Marine Park! The East Coast Explorer Package features the perfect combination of east coast activities and without being in large groups! Explore Fraser Island on a guided tag along tour in a 4WD vehicle and chill out in Hervey Bay for 2 nights. Then head on up the coast to Airlie Beach for a relaxing Whitsunday Islands escape on an overnight boat cruise and 2 nights accommodation in the tropical paradise of Airlie Beach. Or you can start in Airlie Beach instead, the itinerary is as flexible as you would like it to be! So you can start in Airlie Beach or Hervey Bay and use the nights accommodation in both places on whatever nights you like, but we would recommend using one night before and after each trip. Transportation between the two destinations is not included, the distance between Hervey Bay and Airlie Beach is 900km (roughly a 12 hour drive), so you need to allow at least one day for travel. We are happy to book you onto a Greyhound bus and highly recommend the overnight bus as it is considered the most convenient and affordable way of getting from one destination to the next. Bus fees starting from $109pp. The East Coast Explorer Package is the perfect package for most ages and travellers looking to experience the east coast of Australia without missing out on any of the action. The package has been designed so that you may easily fit the two destinations into your travelling itinerary whether you are flying, driving or busing it up or down the east coast and you can leave just days between the destinations or weeks if like. Hervey Bay is the gateway to Fraser Island and is about 290km (roughly a 3.5 hour drive) north of Brisbane. On the Palace Self Drive Guided 4x4 Camping Safari you will get the best of both worlds. Not only do you get to drive yourself and your friends on the worlds largest sand island, but you also get the benefit of a guide with local knowledge, bad jokes, great stories and plenty of four-wheel-driving experience. Tag along tour allow solo travellers and groups of friends to band together and travel around Fraser with absolute ease, there is one lead vehicle in the group and the rest are self-drivers, connected by radio. You will be provided a full safety and information briefing at 4.00pm the afternoon before departure. So the best plan is to stay the night before and after the tour at Palace Backpackers in Hervey Bay which is the base for your tour. All necessary cooking and camping equipment, with easy setup canvas tents. Please note to drive you must be 21 years or over and have a full car drivers licence, most international licences ok.
Airlie Beach is the gateway to the Whitsunday Islands, part of the Great Barrier Reef Marine Park. Located about 1100km north of Brisbane and about 620km south of Cairns. Onboard Whitsunday Adventurer for 2 days and 2 nights you will snorkel through a wonderland of underwater gardens, kick back and sunbathe on the infamous Whitehaven Beach and indulge in the luxury of a warm spa bath at sunset. Adventurer. Look forward to delicious meals and snacks throughout the day freshly prepared by your host and when you are not eating, get involved with all the on board activities like sailing, kayaking, snorkelling, bush walking or even try your hand at the new Stand Up Paddle Board! Check in for the boat trip is in Airlie Beach the day before departure or early on the morning of the trip so best plan is to stay in town the night before and after the boat trip. Base Backpackers will give you the chance to see the thriving night life that Airlie Beach is renowned for across the country! Situated in the heart of Airlie Beach, opposite the swimming lagoon and beach, Base is no more than 50 metres away from all the facilities on offer making it the perfect place to stay to experience the Whitsundays. The private accommodation option is based on two people sharing and includes private double cabin onboard Adventurer as well as private rooms at both backpackers, camping on Fraser Island is shared still. We have designed these packages so they are suitable for those wanting to fly, train or bus it and also for those with own cars or campervans. How and when you make way between the Airlie Beach and Hervey Bay is up to you and at your own cost. It is about 900kms or a 12 hours drive between the two locations, so you need to allow a good day for travel. We recommend Greyhound Buses. Fraser Island - Please only bring an overnight bag with sleeping bag, hat, swim-wear, beach towel, sunscreen 30+, warm clothes for the evenings (seasonal) and cash/card for island purchases. Please feel free to bring on board a reusable water bottle and/or additional snacks. Excess luggage can be stored at Palace backpackers for free for whole trip. Whitsundays - Please only bring a small soft overnight bag with clothes, a hat, swim wear, beach towel, sunscreen 30+, warm pullover for the evenings (seasonal) and cash/card for on board purchases. Excess luggage can be stored at several places in Airlie Beach, for example your boat check-in office or at your accommodation, and they usually charge between $5-10pp for whole trip. 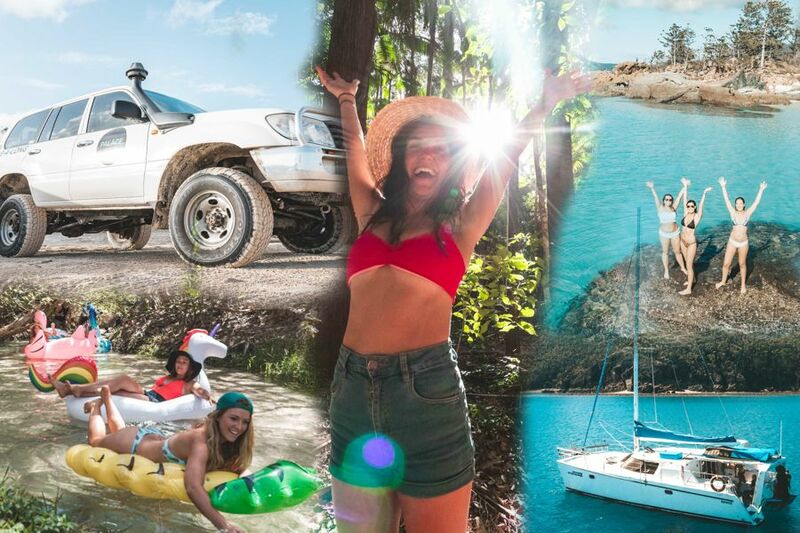 Fraser Island - Vehicle hire, vehicle and vamping permits, cooking and camping equipment, return barge, standard insurance, cleaning costs, lead driver/guide, fuel, linen, bag storage and pick up from bus station. Whitsundays - Skipper, crew, meals, linen, wetsuit hire, snorkelling equipment and all Marine Park fees. The private accommodation option is based on two people sharing and includes private double cabin onboard Adventurer as well as private rooms at both backpackers, camping on Fraser Island is shared still. Fraser Island - Sleeping bag hire if required is $10pp for the entire trip. The $110pp local fees are included in the total ticket price but not taken at time of booking they are to be paid on check in to Palace Backpackers. The break down of these fees are $90pp for Fraser Island daily commercial activity fees, Fraser Island camping permits, vehicle insurance reducer and return ferry transfers to and from Fraser Island and then $20pp for Fuel. Also please allow approximately $25pp for the food shopping you will do as a group prior to departure. You will be asked to contribute your share of the $500 vehicle bond in cash, which is approximately $60 per person. No credit card imprints are taken but if an accident occurs, all passengers in the particular vehicle are liable. Whitsundays - Just BYO drinks. Transfers - Getting between Airlie Beach and Hervey Bay is not included, but we recommend the Greyhound bus service, they operate an overnight bus North and South bound daily, please enquire with us. All client cancellations forfeit 25% of total ticket price and all client cancellations made less than 21 days prior to start of package will result in complete forfeiture of the full price of the package. If any of the tour operators have to cancel a tour and we cannot offer a suitable alternative, then a refund will be given minus card fees. We strongly recommend that you have travel insurance, especially during the wet season. Thank you for booking with Mr Travel/Sailing Whitsundays. If you would like any advice or assistance in arranging other accommodation, transfers or additional tours, please do not hesitate to contact us.